New Biomutant Trailer Showcases the Title's Vast Customization | Nerd Much? It’s been a while since THQ Nordic has last given us a glimpse of their highly anticipated action RPG, Biomutant. We last saw a quick minute and half clip of gameplay during Gamescom a few months back. So to keep the title prevalent, the publisher dropped a new Biomutant trailer as we begin to get nearer to closing the year out. Today’s new Biomutant trailer looks determined to detail exactly how much character customization will be at our disposal when the title arrives. THQ teases that the game is designed as a “post-apocalyptic Kung-Fu fable RPG.” And you get to see that on display in today’s footage. There appears to be a ton of variety at our disposal when it comes to crafting our lead character. This new Biomutant trailer alone showcases a bunch of different looks, with numerous combat options too. There are large swords, nunchucks, staffs, boomerang blades, throwing stars and more. A couple of boss fights look to be on display in the new Biomutant trailer too. While likely not a boss, a creature that looks incredibly close to Star Wars‘ sarlaac is shown. There’s also a giant boss battle that it looks like you’ll face on “horseback” too. Although slightly similar to an equine, these certainly aren’t horses. But it does look like customization of your mount companion will be available. As there are numerous different varieties of rideable creatures that we see in the new Biomutant trailer too. Crafting will be available, offering diversity in weaponry. And you can make those weapons with whatever type of gear you desire in the moment. Transversal is just as unique as the rest of the game. With options to travel by foot, mech, jet-ski or air-balloon as your disposal. The developers have previously said that the game would allow for open-ended exploration akin to The Legend of Zelda: Breath of the Wild. You can look to tackle the 5 bosses threatening the Tree of Life’s roots, or ignore then and attempt to heal the tree another way. The title is truly all about freedom of choice. Today’s new Biomutant trailer put those options on full display. 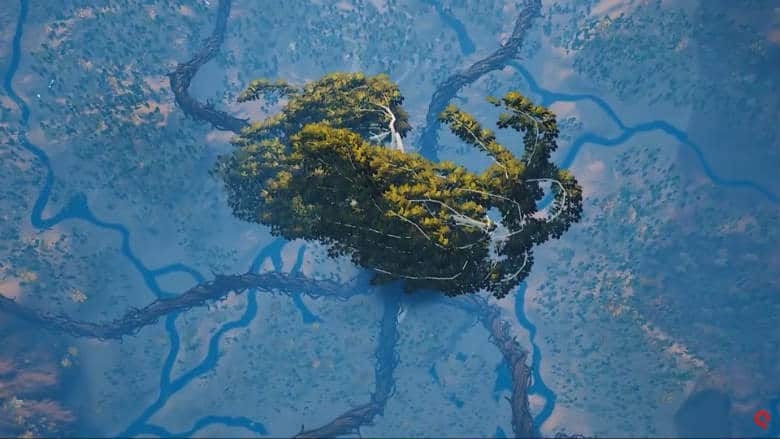 And we even got a glimpse of the game’s infamous Tree of Life and the 5 main roots that stem from it. Which option will you choose?